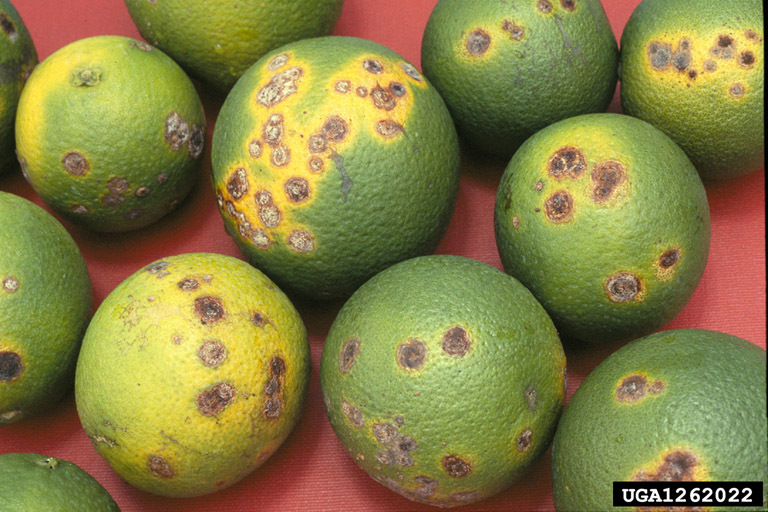 Citrus greening, also known as HLB, is the most destructive disease of citrus. 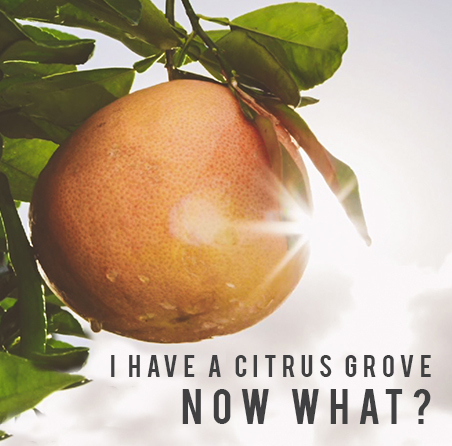 This disease poses no threat to humans or animals, but can destroy all types of citrus trees, including orange, grapefruit, lemon, lime, kumquat, tangerine, and relatives like orange jasmine. This disease is a serious threat to our South Texas Citrus Industry. It is spread by a small insect called the Asian Citrus Psyllid (ACP). Once a tree is infected, there is NO CURE. Citrus greening was first found in South Texas in January of 2012. The Texas citrus industry is in great risk of losing its trees, which could negatively affect the RGV’s job force, economy and culture. Growers are diligently working to slow the spread of this disease, but they cannot do this without residents help. If a citrus tree has this disease and is not removed, psyllids can continue to spread citrus greening to other citrus trees, including neighbor’s trees as well as local citrus groves. HOW DOES IT SPREAD? – This disease is easily spread by moving infected plants (including infected trees from nurseries) and by a small insect called the Asian Citrus Psyllid (ACP). Propagation or production of new trees using bud or budwood materials from infected trees is also a prime way to spread citrus greening. LOOK AND LEARN – Know what to look for. It can take years for symptoms of citrus greening to appear. Almost any change from the normal should be checked closely. Inspect citrus trees every two weeks. View photos of psyllids and citrus greening at http://www.citrusalert.com to help you identify an infected tree. REPORT INFECTED PLANTS – To stop the spread of citrus greening, we depend on you to report signs of the citrus disease. If you think your tree is infected, report it immediately. YOUR CALL COULD SAVE OUR TREES. 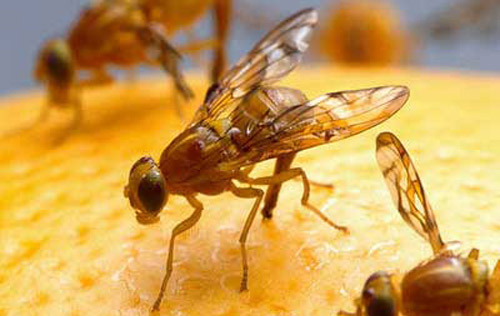 The Mexican fruit fly, commonly known as Mexfly, is an invasive pest that threatens the agricultural production of more than 50 fruit types in the Rio Grande Valley (RGV) of Texas and across the United States. The Mexican fruit fly was first found in Central Mexico in 1863, and by the early 1950s flies were found along the California-Mexico border. The pest has since been detected in Arizona, California and Texas. The US Department of Agriculture (USDA) reports that losses caused by Mexfly establishment could cost an estimated $1.44 billion over a 5 year period of time. Mexfly migrates to the RGV from unmanaged, highly infested groves near the border in Mexico. As a result, the Texas citrus industry has been subject to one or more quarantines on an annual basis for over 80 years. In spite of this, the RGV is a world-renowned powerhouse of quality citrus production, contributing more than $140 million to the State’s economy on an annual basis. ABOUT THE MEXICAN FRUIT FLY – Female fruit flies lay their eggs in ripening fruit. The eggs hatch into larvae that eat the flesh of the fruit, causing it to rot. Fruit that has been attacked may be unfit to eat. Larvae feed while tunneling through the interior of infested fruits. Microscopic organisms invade these injured areas causing internal decay of the fleshy portions of the fruit. DON’T MOVE CITRUS PLANTS – The Texas Citrus Industry along with The United States Department of Agriculture (USDA) and the Texas Department of Agriculture (TDA) have been working on a suppression program since 1986. This program releases sterile fruit flies in an effort to eradicate the Mexican fruit fly from South Texas. The industry is at serious risk from hot spots particularly in residential areas. Current efforts of treating dooryards after flies are trapped is limited and not an effective overall strategy for the dooryard situation. It is not practical to treat all dooryards and even if it were possible not all homeowners would not be supportive of such treatment. REMOVE YOUR FRUIT FROM THE TREE – It is very important to remove all citrus fruit from the tree at the end of the season to reduce the population of the Mexican fruit fly. Either eat the fruit or dispose of it in the trash. If you have fruit that you do not intend to eat, such as Sour Orange trees, it is best to remove that fruit as soon as possible to avoid your tree harboring the Mexican fruit fly. 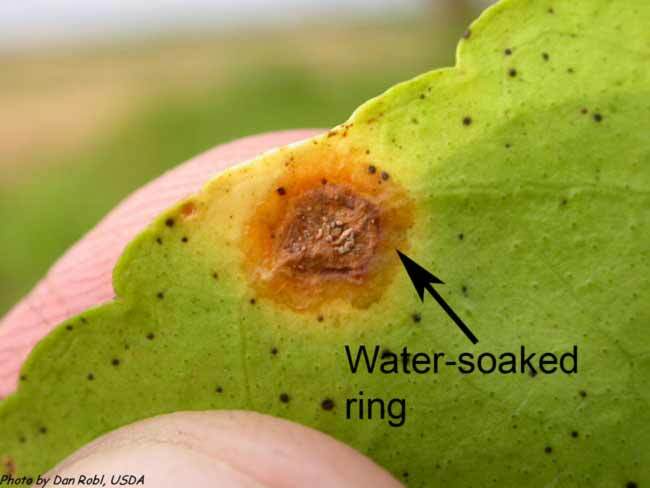 Citrus canker is mostly a leaf-spotting and fruit rind blemishing disease, but when conditions are highly favorable for infection, infections cause defoliation, shoot dieback, and fruit drop. Citrus canker symptoms include brown spots on leaves, often with an oily or water-soaked appearance. The spots (technically called lesions) are usually surrounded by a yellow halo, and they can be seen on both the upper and lower sides of the leaf. Similar symptoms can appear on fruit and stems. 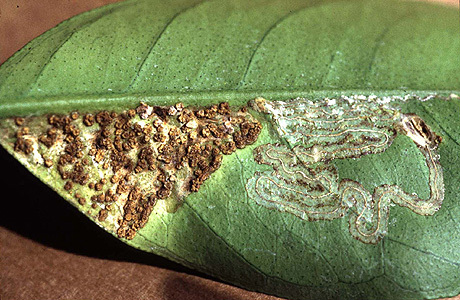 Also, Citrus Leafminer (CLM) damage created by larvae that feeds by creating shallow tunnels or mines, exposes more tissue to citrus canker infection and increases the infected areas. This photo shows leafminer with citrus canker in the leafminer tunnel. Citrus canker is a highly contagious plant disease and spreads rapidly over short distances. Wind-driven rain and water splash are the primary means of short distance spread within and between trees. Irrigation can increase the risk of disease spread. Contaminated tools and equipment, people and birds can spread citrus canker. Long distance spread occurs through the movement of infected plants or plant parts including nursery trees and propagation material (budwood, rootstock seedlings and budded trees). Hurricanes and severe weather events of strong winds and rain can spread citrus canker long distances. Citrus canker bacteria may survive for up to 10 months in lesions on living citrus plants. Survival for long periods is possible in diseased plant tissues including the discolored bark on citrus tree trunks and limbs and in plant debris. If you think you see symptoms, DO NOT TAKE SAMPLES as moving samples can spread the disease. Contact www.saveourcitrus.org to report any suspect trees. Check your citrus trees every two weeks for symptoms of both citrus canker disease and citrus greening disease.